Attention : we are the best in town! we have the power to connect you to solar panels. Buy Solar Panels and Reap the Advantages of Solar Power! With alternative energy sources becoming increasingly valued in the U.S. today, more and more people are looking for ways to incorporate clean energy into their homes. 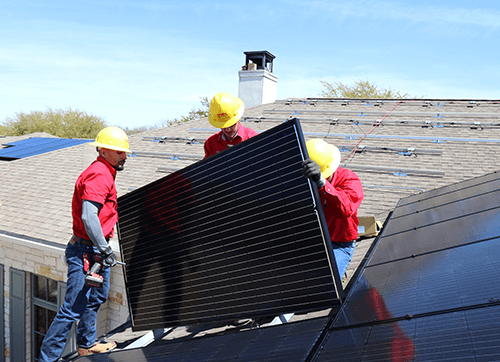 At GVEC Solar Services, we are your go-to resource for high-quality, affordable solar panels in Seguin, New Braunfels, Schertz, Cibolo, Cuero, Gonzales, Yoakum, Hallettsville and other surrounding areas. Our solar panel systems are durable, affordable, and save you money. Plus, you can feel great about using renewable, alternative energy that protects the environment. We’ll help you make the most of manufacturer rebates and government tax credits—We’ll even help members sell back excess energy for a profit! Our specials and financing offers (for those with approved credit) can help you save even more! Using the sun’s free energy to power your home seems like a great idea, right? But how do you convert this green energy into actual, usable energy resources for your home? The answer? A solar system from GVEC Solar Services. Once we conduct a site evaluation, we’ll design a system custom tailored to your home’s needs and site layout. After permits, homeowner association approvals, and installation (we do all of this), you can begin using your solar energy right away—monitoring it right from your home computer or phone app. We get this question a lot at GVEC Solar Services. In fact, the advantages of solar energy in South Central Texas cannot be overstated. They offer diverse applications for energy use in the home at a low maintenance cost, and because they’re renewable, you’re helping the planet and saving money. Let GVEC Solar Services install solar for you! Considering a Home Solar Power System? Choosing high efficiency solar panels for your home is an investment, but you’d be surprised at how affordable it is to go solar. You’ll begin to see the benefits of solar energy right away. GVEC stands by their product. We provide warranties on our equipment and installation with longevity in mind! Did you love your experience with GVEC? Leave us a quick review to let us know! © 2019 Copyright GVEC Solar Services. All Rights Reserved. License #TECL32802.